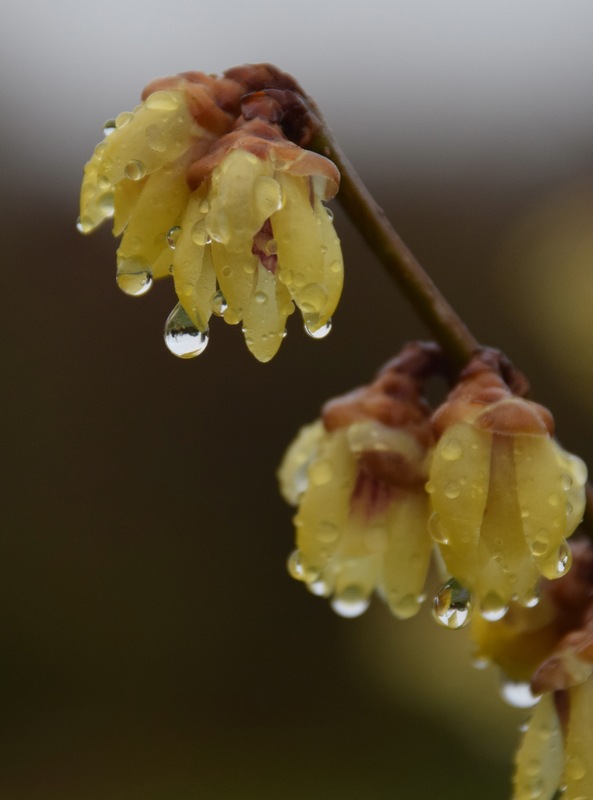 For ten months of the year Chimonanthus praecox (wintersweet) is an unassuming shrub – unassuming to the point of being ugly! In summer it is dull with rather long, rough, mid green leaves that don’t add much beauty to the garden. They do turn yellow in autumn but you are then left with a slightly gawky shrub with angular, stiff twigs. But just as your forays into the garden are rewarded by little more than chilblains the round flower buds swell and open into pale yellow blooms. If your plant is growing happily these will provide a haze of pastel colour but, far more important than this, approaching the shrub will be rewarded by one of the most delicious fragrances of the whole year. Now I do realise and confess that, in winter, it is easy to get carried away by tiny flowers and sing their praises. Usually winter flowers are small, though fragrant, and would be overlooked in summer. 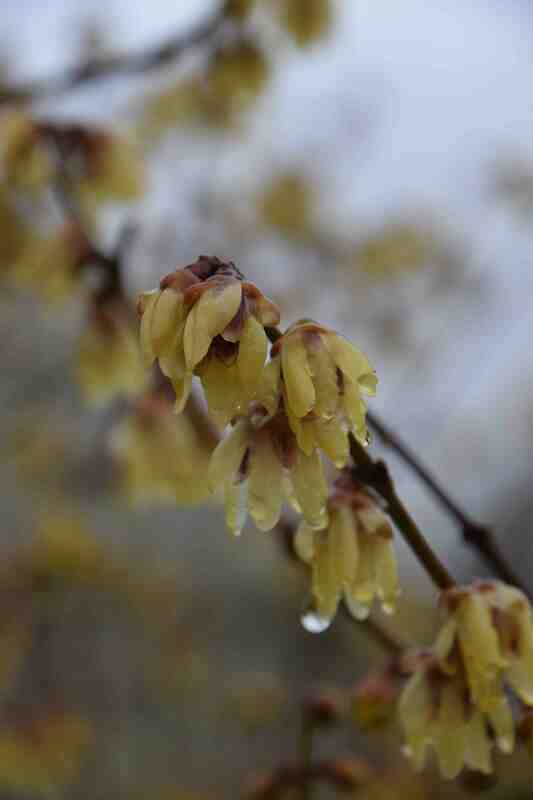 In this way wintersweet is rather like mignonette in that it is the fragrance rather than the looks are what we value. Even so, wintersweet flowers are very pretty. They are not just straw coloured but their texture is rather strawy too and inside the six or so outer petals are some deep maroon petals, and five or six stamens, that give some warmth to the interior of the blooms. Wintersweet is native to China but has been cultivated there for centuries and, in Japan, for a millennium. It was introduced to Europe in 1766. In time a plant will reach 3m high and wide. When first grown in Europe it was thought to be tender and was grown as a greenhouse shrub. In fact it is perfectly hardy but it does need a good summer to encourage flowering and it is often grown against a west- or south-facing wall. In any case it does require a sunny spot in all but the hottest climates. The flowers are produced on one and two-year old stems so, if any pruning is done it should be carried out in late spring, after flowering, restricting the cutting to a little shaping and removing weak and diseased stems or very old shoots. It seems slightly odd that a plant that has been cultivated in Japan for so long has so little variation – unless, of course, there are variations that we in the West have yet to discover or import! The most notable variant is ‘Lutea’ (or ‘Concolor’) which has blooms of pure yellow, and there is also ‘Grandiflora’ which is reportedly slightly less fragrant though I have not compared it. A variegated version, that is slightly less dull in summer, would be nice as long as it still blooms well. There are three or four species of chimonanthus though only this one is widely grown and it is related to calycanthus. Oh, and the scent! It is sweet and spicy and a real joy. It is more delicate than good old Viburnum x bodnantense and more sophisticated than sarcococca. This was one of the first scented winter flowering shrubs I planted and I always look forward to it flowering. This year it seems earlier than before. Thanks for the added background knowledge – it’s nice to know more about it! Along with Daphne bholua ‘ Jacqueline Postill’ this is my favourite winter beauty. I grew my Chimonanthus from seed, I didn’ t know at the time that they take 7 years or more to flower from seed or I might not have bothered. Still it was worth the wait.The flowers are so pretty and they smell divine.